Karkar volcano along with its neighbor Manam is one of Papua New Guinea's most active volcanoes. The volcano is located on Karkar Island off New Guinea's north coast 64 km north of Madang. The forested Karkar Island is 25 km long and 19 km wide and cut by 2 nested summit calderas. The 5.5-km-wide outer caldera was formed during one or more eruptions, the last of which occurred 9000 years ago. The inner caldera is almost circular in shape and has 3.2 km in diameter with vertical walls up to 300 m high. It was formed during violent eruptions sometime between 1500 and 800 years ago. The historic activity at Karkar volcano, recorded since 1643, consisted in small explosions including strombolian and phreatic eruptions. Most eruptions came from Bagiai vent, a cinder cone inside the inner caldera. Karkar is an basaltic to andesitic stratovolcano and part of a chain of 15 volcanic islands in the western part of the 1000 km long Bismarck volcanic arc. Karkar volcano has flank cones on the northern and southern flanks of the volcano. A linear array of small cones extends from the northern rim of the outer caldera almost to the coast. The floor of the caldera is covered by young, mostly unvegetated andesitic lava flows. 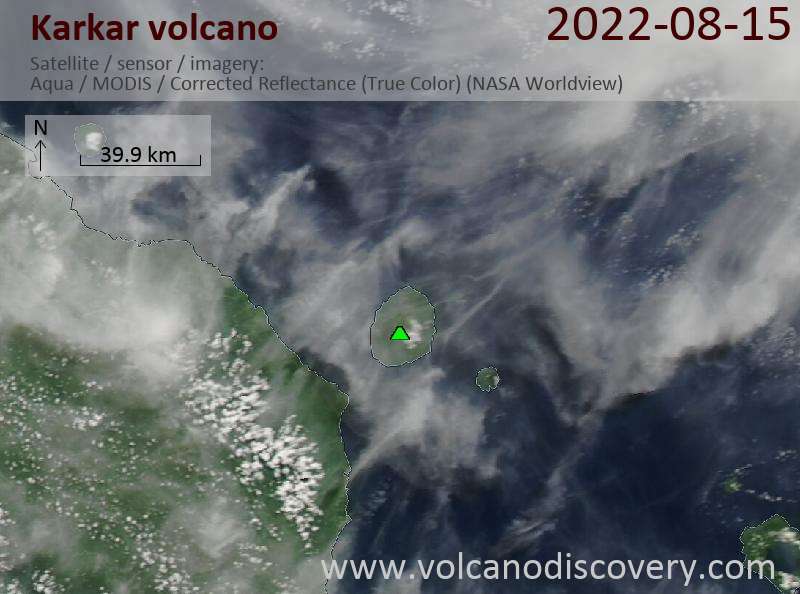 High plumes, possibly ash bearing, from eruptions at Karkar were detected on satellite imagery reported from the VAAC Darwin in 25-26 November 2009, early December 2009 and during February 2010. However, independent observations could not confirm that an eruption took place. A possibility is that the plumes were caused by thunderstorm activity and / or some kind of low level activity. The Smithsonian does not count these events as eruptions. An increase in thermal activity and gas emissions from vents on the SE and SW flanks of Bagiai cone were observed in 2007. Vegetation in the caldera died. In February 2008, 15-20 volcanic earthquakes were recorded daily at the volcano. The last confirmed volcanic activity from Karkar was in September 1997 when fumarolic gases killed vegetation downwind. Karkar volcano started to produce explosive eruptions in January 1979, following 6 months of increased seismic and fumarolic activity. This increase in activity was detected on 10 July 1978. On 8 March 1979, an explosion at about 01h00 local time ejected incandescent bombs that could be seen from the New Guinea mainland in 30 km distance. The eruption killed the 2 volcanologists Robin Cooke and Elias Ravian who at that time camped on the volcano. After almost 80 years of being dormant, new eruptions began on 14 February 1974 and continued until 8 August 1974. The eruption consisted in strombolian activity from the summit vent of Bagiai cone in the caldera, and also produced basaltic-andesite lava flows from two vents on SE flank of Bagiai. Similar activity resumed in January 1975 with new effusive and explosive vents. Stronger ash explosions were observed between April and June 1975. Karkar volcano began to erupt on 17 June 1895 when a numerous earthquakes were noted. 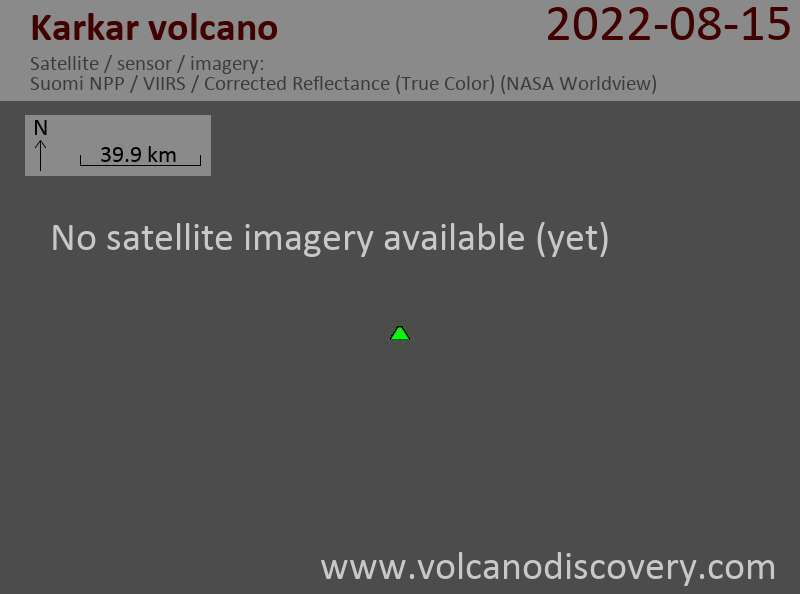 The eruption continued intermittently until August. Smoke and ash were seen at the volcano. On 20 April 1843, Tasman saw "a great flame come steadily from the top of the mountain".